Shade yourself and your grill with this handsome Linea fabric-top grill gazebo. The gazebo features convenient built-in hooks to hang grill tools within an arm's reach or even plants to spruce up your grilling area! You'll stay cool and dry in the shade and shelter of this grill gazebo, meaning you won't have to sacrifice grill time because of blazing sun or rain ever again! This Gazebo Penguin<sup></sup> Children's Gazebo is perfect for outdoor entertaining for your little ones and their friends. Or use it inside during the cold season! The gazebo can be transformed into a sitting room (cool by day without being exposed to the sun, thanks to ultraviolet shielding in the roof), a playhouse, or even a bedroom on muggy nights. It also offers other great advantages such as protecting children from UV rays, animals, and bugs while they play outside. The Roma gazebo provides the perfect outdoor lounging area for your garden or backyard. This all season hexagonal garden living space is a gorgeous centrepiece. Sturdy and durable, this gazebo is comprised of high quality aluminum structure with a powder coated granulated finish. Its virtually unbreakable, 100% UV protected 6mm twin-wall polycarbonate roof panels protect from harsh weather conditions for long term durability. Thanks to its stylish, clean design the Roma gazebo will add class to your garden's appeal. Our elegant, traditionally shaped hexagonal gazebo can be used year-round and lends a refined touch to any garden environment. The Bluffton Hexagonal Gazebo is a shady oasis, protecting you from the hot summer sun. It gives friends and family an outdoor area to dine, relax, or mingle! 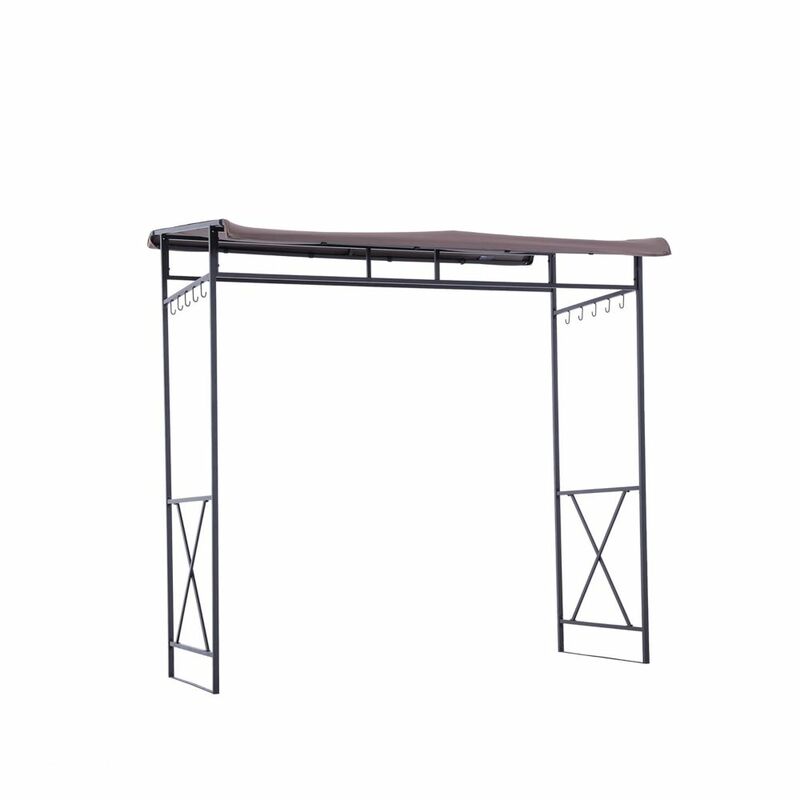 Its two-tiered canopy gives the gazebo an upscale look while the extra large glass shelf adds a convenient area to place books, drinks, food and more. Full bug netting helps to keep your shaded oasis free of pesky bugs and their bites. Linea 4 1/2 ft. x 7 ft. Grill Gazebo Shade yourself and your grill with this handsome Linea fabric-top grill gazebo. The gazebo features convenient built-in hooks to hang grill tools within an arm's reach or even plants to spruce up your grilling area! You'll stay cool and dry in the shade and shelter of this grill gazebo, meaning you won't have to sacrifice grill time because of blazing sun or rain ever again! Linea 4 1/2 ft. x 7 ft. Grill Gazebo is rated 3.0 out of 5 by 17. Why is this advertized as 41/2 feet wide when the listed dimensions say it is only 35 inches wide? &nbsp;Which is it? According to the one unsatisfactory review it is only 35 inches wide? Had just talked to a Home Depot rep, he confirmed it is 4.5 ft wide.